I love when a night exceeds expectations. 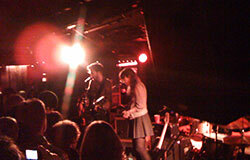 I went to The Biltmore with my girlfriend Bex to see Bowerbirds and Julie Doiron. I expected a quiet night of folk music. I was treated to so much more. Completely shocked by how much I enjoyed this show. I first heard Julie Doiron over 10 years ago in a cafe in Halifax. She was quiet and folky. Which is fine but it didn’t captivate me. Now she has an edge to her music. The girl is still sweet and quiet (I couldn’t hear her when she spoke between songs) but she belted it for most of her songs with growling guitar, driving drums, and a voice that has a deep tone that I didn’t expect. I’m converted – going to explore this established gem in Canadian music. Charming, talented. MUCH more energetic that I predicted. I even danced a little! The lead singer is captivating, a voice so clear and rich. Not one of those singers who needs post production to sound good on an album. Cute accordian player who also does keys. An amazingly original drummer who played keys with one hand. A random dude who accompanied on every second song or so. The band was very honest and appreciative of the enthusastic crowd. Overall, this show far surpassed any of my expectations. My synopsis: go check these artists out when they come to your town! You won’t be disappointed.